With “one of the most arresting first sentences in contemporary writing” (The Atlanta Journal-Constitution), Robert McCammon unfurls his visionary masterpiece of survival, redemption, and the astonishing transformations love can create. 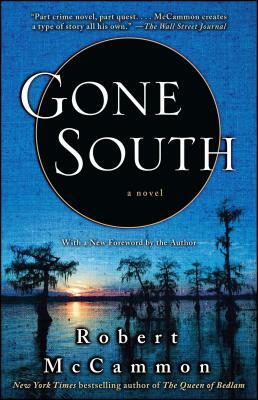 Gone South chronicles a desperate man’s journey through a desperate land, in “a gothic picaresque that mixes gritty plot and black comedy...a smoothly constructed and satisfying story” (The Wall Street Journal). Flooded by memories, poisoned by Agent Orange, Dan Lambert kills a man in a moment of fear and fury—and changes his life forever. Pursued by police and bounty hunters, Dan flees south toward the Louisiana bayous. In the swamplands he meets Arden Halliday, a young woman who bears the vivid burdens of her own past, and who is searching for a legendary faith healer called the Bright Girl. Looking for simple kindness in a world that rarely shows it, bound by a loyalty stronger than love, Dan and Arden set off on a journey of relentless suspense and impassioned discovery...over dark, twisting waterways into the mysterious depths of the human heart.